The Green Movement in Iran contains Hamid Dabashi's most important writings on the Iran's June 2009 election, its tumultuous aftermath, and the characteristics and aspirations of the emerging Green Movement. These analyses range from close analysis of the nature of the events to the Green Movement's historical background and future political consequences. The writings have been modified and updated for book publication. The volume presents Dabashi's account of the events since June 12, 2009-the Election Day itself-and his recap of highlights of the build-up period to the mass protests. He provides insightful background for events on the ground, dealing with debates about the credibility of the election. 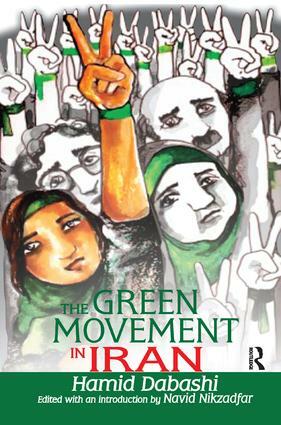 He then discusses political continuity in Iran, as well as the characteristics of the Green Movement. Dabashi argues that the reaction of the custodians of the Islamic Republic to the charge of the election being a fraud only affirms its lost legitimacy, and casts the system as being neither "Islamic" nor a "republic." Dabashi also comments on US politics and its relations to Iran and the Green Movement, pointing out shortcomings in American media culture. The role of the Iranian opposition in the Green Movement and American political policies, the political and economic consequence of the U.S. sanctions against Iran, and the way these may be interpreted by Iranian society are all viewed from an enlightening perspective. Dabashi argues that the Iranian regime, suffering deeply from legitimacy issues, makes use of its bureaucratic, economic, and political leverage to stage a show of support and project division among the people.